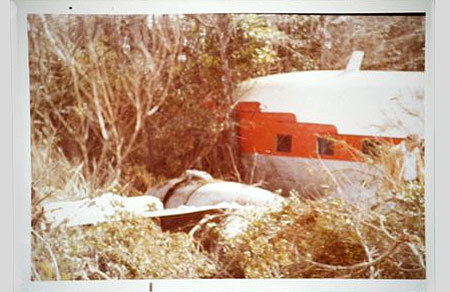 In 2009 I received a series of emails from Randy Jackson of Orlando concerning the crash of a Shawnee Airlines ﻿﻿ DC-3 in 1973. 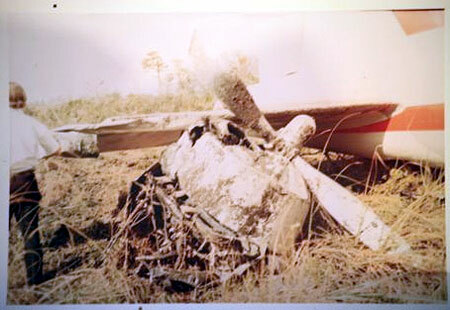 Mr. Jackson initially asked if I had any information on the crash, and I had to admit that I had never found a single mention of it in my years of research. 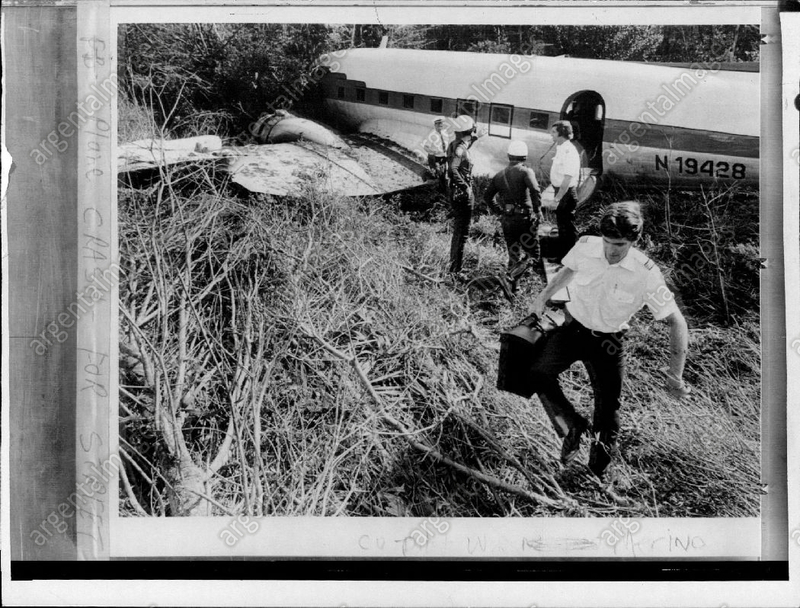 Randy pointed me to flightglobal.com where I found this single sentence: "Four of the 30 passengers on board a DC-3 of Shawnee Airlines were injured when the plane crash-landed near West Palm Beach, Florida on December 27, 1973." 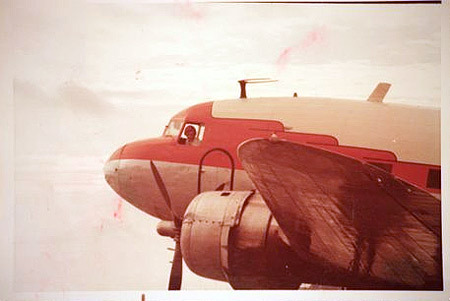 It turns out the aircraft (N19428 msn. 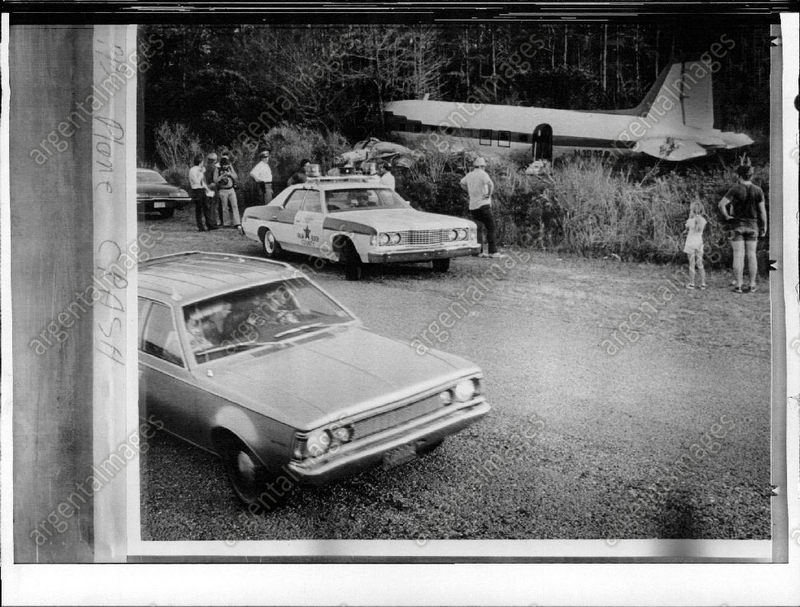 11648) was leased from Aviation Sales & Service Inc., which is why crash reports don't mention Shawnee Airlines. 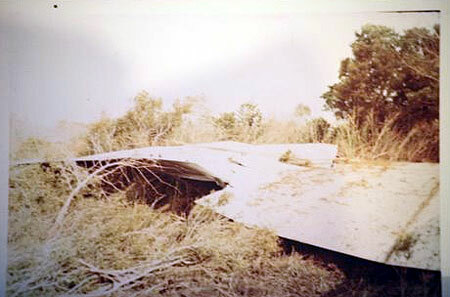 Below: A press photo of the crash site. 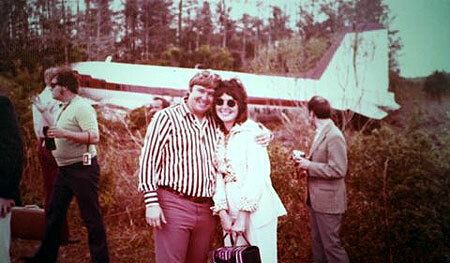 Randy and his wife Dee were aboard the ill-fated aircraft and survived the crash relatively unscathed. Thanks to Randy for sharing his amazing story, along with photos taken before, during and after the flight. Incredible! 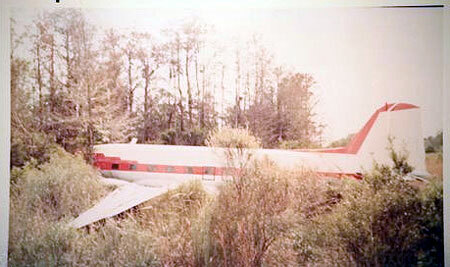 After our engines quit, the Captain told us to prepare for a "hard crash-landing". The airplane went totally silent, NOT a whimper until we hit the ground and trees, and then only a couple of very soft "Oh My Gods". Total silence. You could hear the wind passing over the wings, but inside you could have heard a pin drop. The propellers were frozen, we heard a whooshing sound but not a single word, noise, cry or yell... the entire time of at least 6-7 minutes that we knew we were going to crash, and... nothing. The highway seen in the photo below is where the pilot wanted to land but had to veer off at the last second to avoid hitting a milk tanker truck. Our pilot was credited with saving our lives due to his calm control, excellent emergency (in flight) planning, execution and training. 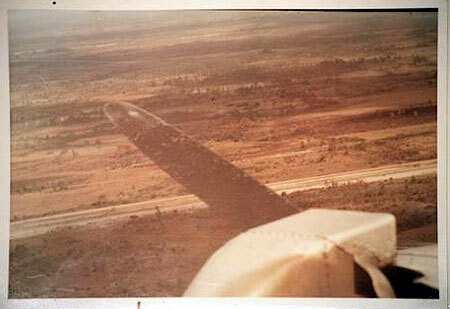 Our pilot, however, had some last minute difficulties that caused last second changes in his initial crash-landing plan. 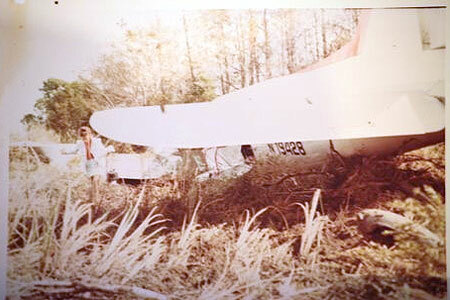 As he was planning to land on a small road, he put the landing gear down. But just 40-50 feet before we touched down, a semi-truck came around a bend in front of us and we veered to the right, into a swampy area with trees. With cool calm (at least from our perspective) he both banked right, and attempted to raise the nose of the plane which would allow the plane to "slap down", digging the landing gear into the mud and water then bouncing to a stop rather than sliding into the trees where certain death would have been waiting. Our plane actually stopped with two trees hitting the nose, one on each side directly in front of the pilot and the co-pilot. Had we slid another 6 inches, they would have both been killed. Our impact was so hard, it split the soles of my wife's shoes. There were many other weird facts, but I just can't remember them right now. Our pilot's quick thinking and cool control saved 30 passengers and we only had minor injuries. A few did have serious injuries but recovered. Yes, we are very happy to be alive!!! Randy and Dee Jackson, December 27, 1973. 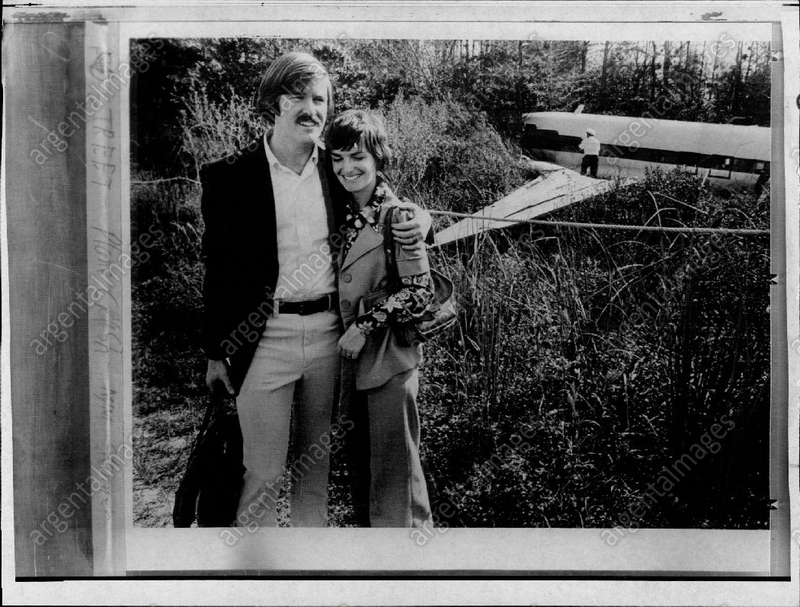 The following press photos appeared on eBay a few years after I originally posted this story. They were ridiculously overpriced, so I had to be content with these watermarked copies.